After sunset, we taped up the entrance with duct tape. We loaded the hive on a wheel-barrow and moved it to the other side of the yard. 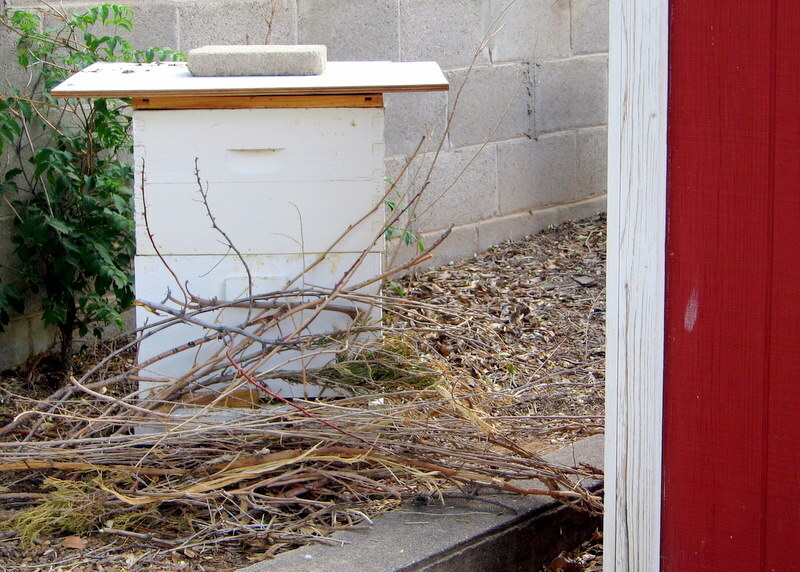 Then for the magic… We piled branches — a lot of branches — in front of the hive and sprinkled mulch on the landing board. In a couple days, we removed the branches and mulch (but the girls had cleaned out most of the mulch). The mulch and branches act as jarring visual cues, telling the hive that something big has changed and that they should re-orient themselves. BINGO! Most of the bees will forget all about the old location and instead fixate on this one, just 10 yards away. Sure enough, the next day, we saw only a dozen bees flying around near the old location but by dusk they were all gone. Most of the bees were happily orienting at the new hive. No problem. If instead of sweet success, you find hundreds of foragers back at the old spot and STILL there the next evening, just put a hive body with frames at the old location. Collect those bees and move the box over to the new hive, placing it on top like a super. Leave the branches and mulch in place (consider adding more). Lather, rinse and repeat as needed. Get more Lazy Beekeeping tips from Bush Bees. That is really good to know. I was just at an Austin Beekeeper meetup, and this topic came up. Most of the folks there brought up the more than 2 feet but less than 2 mile rule. That’s what I’ve always been told as well! But we tried the Bush Bees technique and it 100% worked for us so I shall never again waste time/effort trucking bees all over the city just to move them across the yard. P.S. I ADORE your nuclear hazard paint job! Michael knows whereforeof he speaks. We heard his lazy beekeeping talk at the Northeastern Treatment-Free Conference last summer and had a chance to talk a bit afterwards. I too have had great success with moving hives and putting something in front to cause reorientation. The bees figure things out pretty well. Hi guys, thanks for stopping by. And what a relief for everyone previously following the “2 ft, 2 mile” rule. Glad to hear you’ve had success as well. I might be rearranging my hives now that I’m increasing. If I was smarter I would have put a plan in place before setting the first two hives down. We were so focussed on them we forgot about the +2 hives the following year and so on. I’ve also read a rule about “a foot a day” as a way to shift a hive gradually to a new location. Either way, your plan with the branches and bark to cause reorientation is perfect. Thanks for that tip. Well now it should be much easier, Barbara! If you try the lazy method, report back and let us know how it went. Hi Laura, good question. You know, I leave the mulch and twigs for at least a week. Once the bees have decided to stay put, then I’ll remove ’em. Do your bees seem to be sticking around in the new location? I tried this last night and there were a half cup of bees or so at the old location. It is too cold to let them there and I picked them all up and put on the hive. do you remove the duct tape immediately after relocating hive? HI there. Yes, I remove the duct tape right after relocation, suited up of course. Good luck! I have a BeeHive built into one of my cabin’s second level sub floor. I know the bees are stuggleing these days so I did not want to harm them. However they can’t stay there forever not all of my guests are so friendly towards bees. Howdy! Sounds like you need a “cut-out” or “trap-out” of your bees. I’d suggest calling around you area or contacting your local beekeeping association and ask for someone who does one of the above techniques, both of which will preserve the hive by moving it to a new location at a willing beekeeper’s apiary. Typically, there’s a fee involved as it’s quite labor intensive, so be sure to ask about fees. Thanks for keeping the hive alive! Just returned home from moving my hive which is located in a very urban Vancouver community garden. It needed tonne moved about 17 feet into a new enclosure and Indecided to try the “all at once” method. Thanks to your instructions the move went very smoothly. Now is the wait to see if any return to the old location. I’m a little concerned I used too many branches but I’ll check on them tomorrow. Fingers crossed it all goes well! Thanks so much for your helpful write up! I wanted to leave an update for everyone that visits this page. The move of my hive last night was an absolute success. I’ve visited it twice today and there hasn’t been a single bee spotted at the old location. The branches slowed things down for the girls in terms of going in an out but it all went so perfectly! I’m absolutely thrilled! Thanks again Mistress Beek for posting the information! So grateful to see this post about moving hives shorter distances! — I’m planning on moving my hives to another yard just under 1 mile away — I’m concerned that although the method for putting branches and mulch at the entrance worked for having the bees reorient to a space just a short distance away, will it work for a much longer distance away, but still not the full Sacred 2 Miles away? — I’m wondering whether the bees would have an easier time finding your new placement across the yard because they are still orienting to the same yard, and therefore find their old home easier than they would in my situation — I’m a worried BeeMomma, wanting the best for the bees! Can you offer any advice/thoughts? My understanding and opinion is that this method would also work, and possibly even better, for a hive located 1 mile away. Give it a shot and keep us posted! I like you post(s) regarding the lazy way to move bee hives. I have read other articles regarding the same method. Some suggesting a 3 day and 3 night “lockup.” Anyway, I am going to wait a few days after the next hive inspection before I move my colony only about 10 yards. Thanks for reaffirming this method. I just tried this method last night. I’m in SE Michigan and it was a cooler night. We waited until it was almost dark, taped up the hive, moved them, untaped and put the branches in front of the hive opening. This morning was good. This afternoon, was not as good. Just went out to check again. There are several bees buzzing around the old location, but also, several buzzing around the new location. In fact, it seems they’re flying back and forth between the two spots. It was about a 100 yard move. I just read your “What if it doesn’t work” part. I don’t have another box, just two honey supers I’ve yet to use. (I’m a brand new beekeeper as of early June and my mentor placed my hive in a direct line of traffic for my kids). So, do I wait until this evening to see if they’re still flying around the old location or do something now? And if I need to place a box, can I just use one of the honey supers as a box for now and then if I get to a need for a second super, just get another one? Just hoping I didn’t screw up my bees. Sounds like you’re doing just fine! Several bees buzzing around is no problem. You might watch them come nightfall and if there’s a large cluster on the ground int he old location, then put one of your honey super there with a top on it (and an opening at the bottom, obviously, so they can get inside). Then, the next morning, move that super and place it on the top of your stack in the new location. Keep repeating as necessary and keep your sticks and mulch at the entrance of the new hive for several days. Just moved mine two days ago using this technique, sorry to say it didn’t work for me. I have got tons returning to the old spot 30 feet away and on the second day I have hundreds of half dead bees everywhere. It’s so bad I have to wear shoes in the back yard because I have steped on a few and gotten stung. My buddy said they are going back because they smell the hive there. Right under the old spot where the hive was, they are landing. But now they are landing everywhere. By the new hive spot I have tons of bees dieing on the ground. Bad news, Dave! Have you put a box back at the old location? This will give the returning bees a place to huddle and stay warm while you decide whether to move the whole hive back or not. You know, I think it’s not the smell but the “radar” that bees have oriented to that spot so the power washing won’t help much, I fear. Consider putting a box there with frames to gather any returning bees. Once the sun goes down, take that box and put it ON TOP of the new hive. Leave all the leaves and twigs and such. Then the top bees will be forced to go back down through the lower boxes and twigs, hopefully reorienting themselves to the new location. I moved two hives about 500′ night before last after reading a thread about this some time ago. I did leave them shut in until last night when I removed the screen and tape. This morning I have a good number returning to the original spot so I placed a nuc with a few frames there. I made sure I placed a lot of green foliage in front of the entrances of the hives, but I’m a little concerned I’ve made a mess of things. This evening I will inspect the new location to see what they are doing (and hope that they are not back en masse to my original location). I have been criticized about doing it on a couple fronts, which is NOT helpful to a newbie. If I have to move the hives back, I should do it the same way I presume? Thanks for your response! So, just thought I would leave my experience with this. I have read most of what’s out there on the web on this topic, and your post is what pushed me over the edge to try this method. I also had people telling me that unless it’s the dead of winter, or is raining out, that closing up the bees for several days would not make them happy. I moved my hive in the evening, piled up branches in front of the entrance, and put a small piece of wood to close the entrance, so they would have to push it away (which they did). 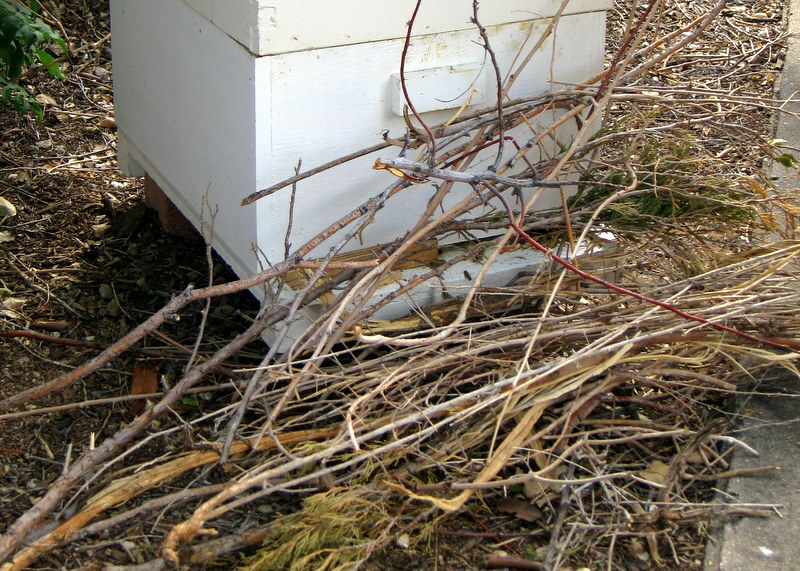 The next day, I immediately had hundreds of foragers looking for their old hive. By the end of the day, there were less than 100 bees, and I put a box out for them. Probably 50 bees were on or in the box, and I did my best to carry them to the new location (~300′ away in a neighbor’s yard). I did this twice, and no longer have clumping at the old hive location in the evening, but 5 days later, I still have lots of activity at the old hive location during the day. They seem to still be looking for their old home :(. But, I guess they are surviving and going home at night, or else these older foragers wouldn’t still show up everyday. I did move the branch away after the 3rd day or so (I had to move it to put some stragglers onto the landing board, and wasn’t able to put it back), and I also have not reintroduced the bees by putting the box into the stack of the hive – I’ve either just put it unattached on the top of the stack, or gently brushed the bees onto the landing board. There just weren’t enough in the box to warrant opening up the hive – I would have let as many out of the hive as I would have been putting back in, and they only clumped in the evening, so I was afraid that the ones who came out may not find their way back in. So, hopefully these stubborn foragers will stop wasting their energy coming back to the old location soon, but so far that’s not the case, which is a bit sad to see. Anyway, thanks for the post, and to all the commenters. So I get the reward for a stupid move. Wish I had read this BEFORE we moved the hive 40 feet. My husband suddenly decided to power wash and stain the deck where my hive resides. I tried to move the boxes in the heat of the day off the deck onto the nearby grass because we didn’t have a trolley and to top it off, I moved one box at a time opening the hive. I’ve never gotten my bees so upset before. Now the deck is power washed but it will take a few more days to get it stained. In the meantime the bees are flocking back to the deck and hanging in a clump off the railing. Any advice would help. Supposing I need to rent a trolley? My husband wants to relocate the bees again off the deck but I fear that would surely do them in. Hard to have bees when one resident (me) loves the bees and the other doesn’t….ha. Hi Joy, how are your bees doing now? What folks typically do when the bees keep returning to the old spot, is put a hive box in that spot all day and then close it at night and move it to the top of the main hive in its new location. However, you MUST add the mulch and twigs in that entrance in order for them to reacclimate as they emerge from this hive. Lather, rinse, and repeat this daily until you’ve moved most of the bees to the new location. I tried it last night and it worked! I had to move the hive a couple hundred yards away. For branches I used the branches from a large boxwood bush we had just cut down. The dense small leaves seem effective at doing the trick! Congratulations! Excellent news and I’m happy it made the job easier for you.